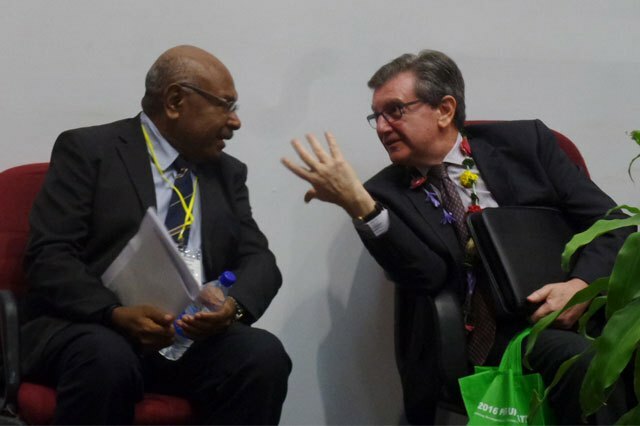 AUSTRALIAN business investment in Papua New Guinea stands at K45 billion, according to Australia High Commissioner Bruce Davis. Davis said the two-way trade amounted to almost K14 billion last year – with 60 per cent of that trade going from PNG to Australia. He told the 2016 PNG Update meeting in Port Moresby that more than 5000 Australian companies run businesses in PNG. The update is an annual event organised by the School of Business and Public Policy of PNG and the Development Policy Centre, Crawford School of Public Policy at the Australian National University. “To me that is an economic cooperation relationship that is at the heart of our relationship, not an aid programme,” Davis said. “Partnerships are about shared opportunities and shared challenges. It’s a partnership that is defined by many things. ‘One thing that I am always struck with is the depth and breadth of the PNG Australia relationship. “I am not referring to the interactions that come in the form of government-to-government engagement, but to the many interactions that occur more informally – and through people-to-people contact. It is through those links that provide the real substance of the relationship.